It really is the most poetic thing I know about physics: You are all stardust. You couldn’t be here if stars hadn’t exploded, because the elements – the carbon, and nitrogen, all the things that matter for evolution and for life – weren’t created at the beginning of time. They were created in the nuclear furnaces of stars. So forget Jesus. The stars died so that you could be here today. to me this is mystic atheism. the sacrifice of the stars, how tiny we are, how insignificant our ego games are, the remembrance that we create dreams that make us the center of the universe. but the universe has no center. and our culture seems to be dreaming that humans, esp. a certain type of human, is so important, so invaluable that some higher being would never let us destroy our own landbase, would never let us fulfill this suicidal run, this game of chicken we are playing with time. but, look. 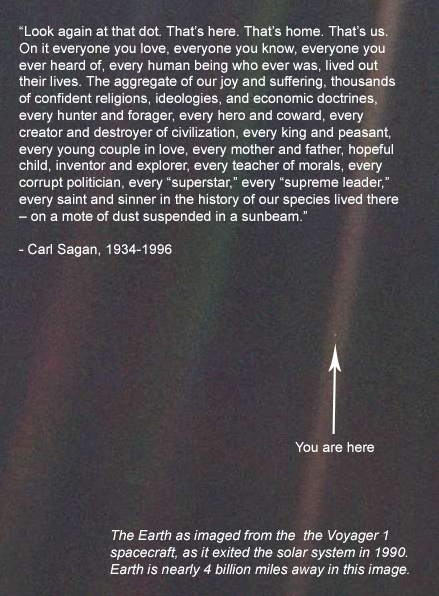 we live on a piece of dust. the only thing that can stop us from blowing ourselves away, is ourselves. You are currently reading stardust suspended at guerrilla mama medicine.